I might be a cookbook junkie but certain cookbooks don’t appeal to me – I would never buy this book , for example. Never. I hate the idea of deceiving kids in order to make them eat veggies and fruit. They should eat good food and be aware of that. They should know what beetroots and carrots and eggplants look and taste like. That’s how my mom fed me as a kid and how I fed my sister when she was little. Therefore, when he asked me which ingredients there were in these croquettes, I lied. I LIED, people. I did not tell him there were dried apricots in it. No, sir. Just plain carrots and a pinch of herbs. Nothing more. Steam carrot in a steamer over a saucepan of boiling water until tender (20-25 minutes). Transfer to a bowl, mash to a smooth purée, add the breadcrumbs, apricots, spring onions, almonds, garlic, parsley, lemon zest, egg, season to taste and mix to form a soft dough, adding more breadcrumbs if dough is too sticky. Roll 1 ½ leveled tablespoons of mixture into cigar shapes then place on a tray lined with baking paper and refrigerate until firm (1-2 hours). Preheat the oven to 200°C/400°F. Heat olive oil in a deep-sided frying pan over medium-high heat. 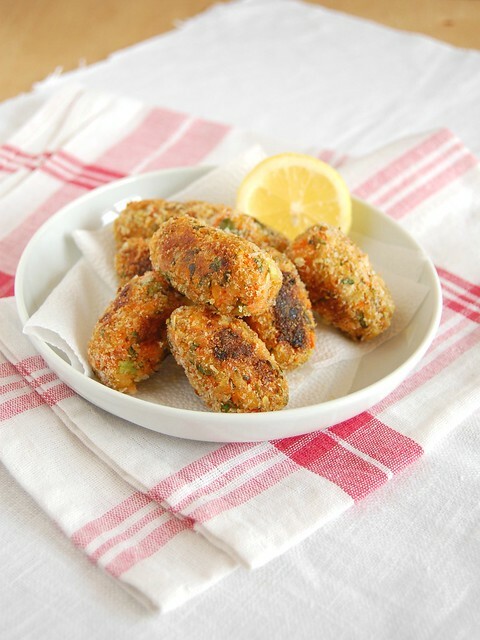 Roll the croquettes in the breadcrumbs, then cook them in the olive oil, in batches, until golden on the outside. Transfer to a baking sheet and bake for 15-20 minutes or until cooked through. I loves croquettes alots. Just made some of croquettes few days ago. It is alright to lie as long as he said, it is delicious! I think I will follow this kind of lying thing to those picky eater. A little lie now and then never hurt anybody! Oo I love the sound of these! With the carrots, herbs and apricots. You definitely wouldn't have to lie to me about the apricots, I'd love to eat them! My gosh this recipe sounds scrumptious! Great shot too. After he ate them, did you confess? He might change his mind, if he knew that he ate them and didn't gag. Carrots and apricots? Well, you got ME intrigued!! These look wonderful - such an unusual combo! It's a lovely vegetarian book that doesn't make a fuss about it. I wanna convince myself that these combination will finely work out with each others. Must be twisted with a white lie. Nevertheless the photograph looks interesting, I'm gonna prepare same version as you have here. Do you think this could be done entirely on the stovetop? Maybe over a low heat to ensure it gets cooked through before burning? I just moved to a place without an oven and I am looking for more things to cook. I think my husband is getting tired of stir fries. Wow, looks amazing! Loving all your pictures and recipes. Very impressed. Today I have prepared these croquettes, but totally baked, not deep fryer, and they were delicious. Thanks for the recipe! Sonia, thank YOU for letting me know how the recipe turned out for you! I'm so glad you liked it!